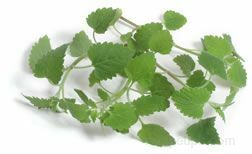 An aromatic herb from the mint family, which is sometimes used in cooking. The leaves and shoot tips from the plant are added to salads, soups, sauces, and savory dishes for flavoring. The herb is also used as a treatment for minor illnesses, such as colds, fevers, and flus. It is used to aid in calming an upset stomach and to relax a person’s nerves. It is generally consumed by adding the dried herb to hot tea. The herb also has a stimulating effect on most cats.